One of the top most "social network" a special network where people gather in "nest" of friends, Facebook, next coming with 'next generation of email', stating from its part that this new messaging service will hail the end as “Email is too slow… email is too formal.., facilitating its users by simplified Messaging. 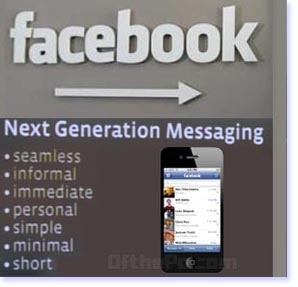 Facebook’s founder and chief Mark Zuckerberg announced at an event Web 2.0 Summit, San Francisco, showcased the ‘next generation messaging system’, which will allow users to have an @facebook.com email address. all in one place which will allow people to reply seamlessly across multiple devices to different types of messages. The aim is to combine all types of messaging in one place, allowing people to reply in real-time. Seamless messaging - allowing people to communicate in several formats, across multiple devices. Store all conversation history in once screen shot, regardless of whether it was email or IM. to make people to be able to communicate in whatever way they choose. One will receive message that really matter to and work with filtered spam detection better than other email spam detectors and prioritise key contacts’ messages - Zuckerberg explained. However few months to go.., this new messaging system to reach us and also Zuckerberg revealed that there is motif to tune further this system to make capable of syncing with other email accounts in the future.